What can I say? It's a giant robot story -- and pretty much like any other giant robot story from the time. 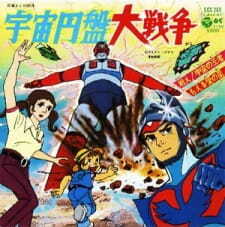 The Seventies were chock-a-block full of series just like this one -- giant robots were a staple of the anime industry at the time. This was pretty much a one-shot 'prequel' to Grendizer. As the sole survivor of his planet, Duke Freed is living an unassuming,secret life as a human on Earth. Until the forces of Great King Yarban arrive, to take back the powerful Gattaiger spaceship/giant robot from him. With Princess Teronna as their leader, she is conflicted between her duty to her father, and her love for the Duke. Of course, all of that is just window-dressing (the premise of a plot) to wrap around the REAL reason that people watch this show: The transforming giant robots. You know the drill: the Duke has to yell out the name of his attack (or transformation) each and every time, as he battles the invading alien fleet. And of course, this story borrows on the fears of the Seventies, with the idea of UFOs and an alien invasion (which itself is a stand-in allegory for Japan being invaded by Westerners...but that's another story), and also nuclear obliteration. All of this wrapped up neatly in less than 30 minutes. As someone who has absolutely no love for giant transforming robots and that nonsense, which I suspect is most of today's anime-watching audience, it holds no interest to me. This show, like many like it, is all about the robots, and without that there really isn't enough interesting characterization or plot to carry it. If you like to watch a plucky young underdog running around in a transforming spacecraft yelling "SPACE NEEDLE ATTACK!!!" as it barrels into a pile of badly animated UFOs, then this show is for you. Otherwise, give it a pass.